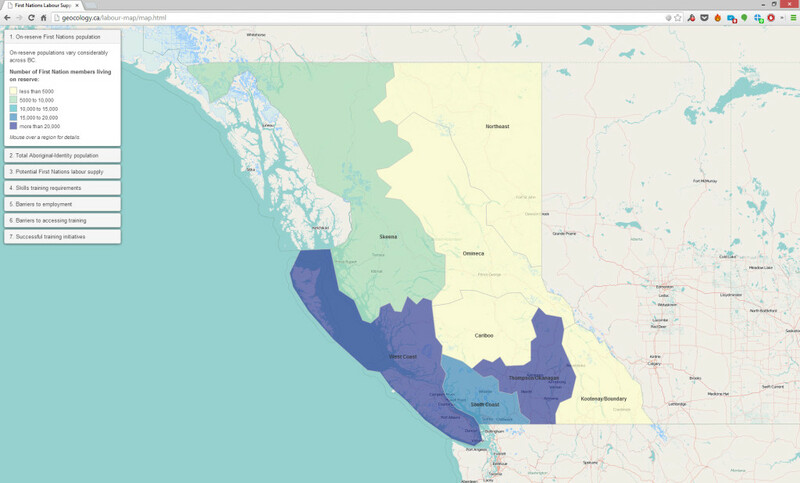 A clean, colourful map telling seven stories that visually summarize a report on First Nations forestry workforce in BC. GMG Consulting was commissioned by the BC First Nations Forestry Council to conduct a study of workforce challenges and opportunities. 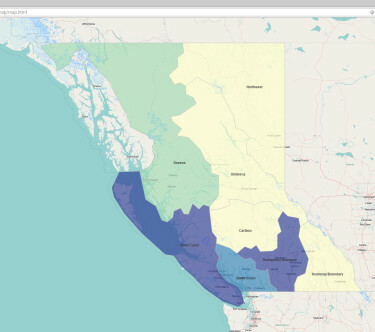 Geocology worked with GMG to craft a map highlighting seven high-level narratives that emerged from and summarized the interviews and surveys GMG Consulting conducted with First Nations people across BC. What we didn’t want to build was a complex map containing every detail of the completed research–in-depth reporting and analysis was the job of the full report, and didn’t need to be repeated in the map. Instead we wanted to tell seven stories, in a way that was could be quickly absorbed by a casual or committed reader. Geocology built a map that provides just the right amount of user control. There is no zooming and panning, because all the narratives are about the entire province. Instead there is a custom legend that steps through the stories, expanding and explaining each one with colours, simple text and subtle transitions. A user arriving at the map can quickly see how much information is available, and how to access it. By hovering their mouse over one of the forest regions more detailed information is revealed if wanted. The map will be embedded in the GMG consulting website and shared with stakeholders and report recipients. A full-screen version was provided for use in public settings, and the map automatically zooms itself to be as large as possible to encourage interaction by passers-by. 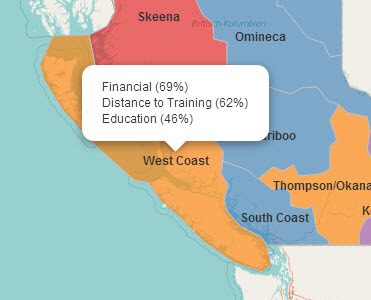 A first test build was completed using D3.js but we chose to use Leaflet because a background map was desired to provide some geographical context, and Leaflet made that easy. There were also concerns about compatibility between D3 and older versions of Internet Explorer, and we wanted to ensure full accessibility. In future however it would likely be good to revisit D3 for this kind of map, perhaps by extending Simple Map D3.